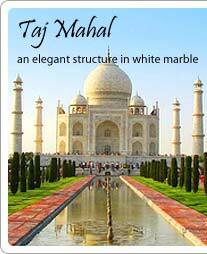 Itmad- Ud – Daula also known as the ‘Baby Taj’ is the first tomb in India built entirely in white marble. It was built in 1628 by Nurjahan, wife of Emperor Jahangir, for her father Mirza Ghiyas Beg, an Imperial Officer who had received the title of Itmad-ud-Daula (Pillar of Government). 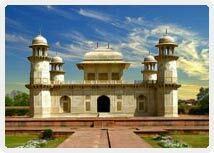 The mausoleum located a stone throw from the Taj in a walled garden close to the bank of Yamuna River. This mausoleum is also the graves of other relatives of Nur Jahan. The walls are built of white marble coated with semi-precious stone like cornelian, jasper, lapis lazuli, onyx, and topaz. Images of cypress trees, wine bottles, fruit and floral decorations dominate the artwork. This monumental building is an example of architectural splendor famous for its arched entrances, octagonal shaped towers or minarets, exquisitely carved floral, intricate marble-screen work and inlay work are all representatives of the Islamic style. On top of this one can see small domed canopies supported by pillars. The tomb is 21 meters high and there are 4 minarets that are 12 meters tall, at each of the 4 corners of the marble platform. The richness and variety of artwork on the walls of the tomb of Itmad-ud-Daulah are truly breathtaking which enthrall tourists during their visit to this place. Open from sunrise sunset. The monument is closed on Mondays. Entry Fee for Foreign Nationals: 750 Rs.